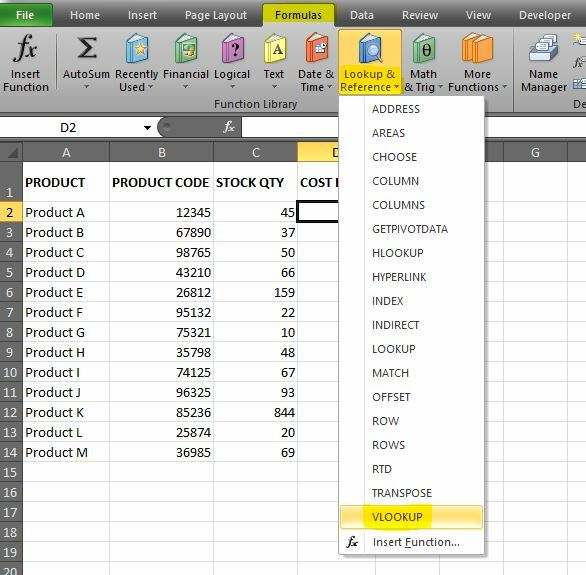 The VLookup formula is my favourite function of Excel; I use it all the time and it saves me so much time! 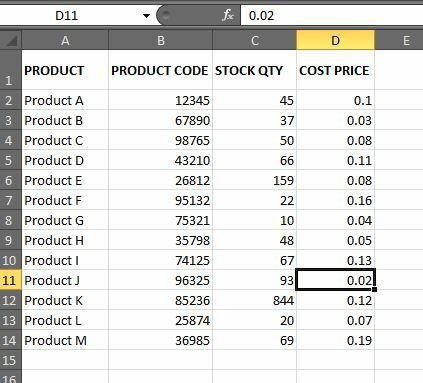 The formula looks up data from one worksheet and uses it in another. Below is an example of how I would use it with a product inventory. 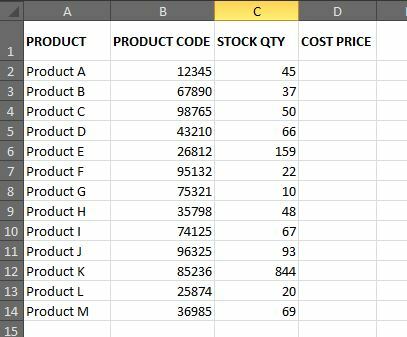 Let’s say we have exported product stock information from another source into an Excel spreadsheet. 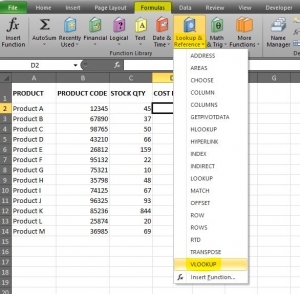 This worksheet contains the product name, product code, and stock levels. 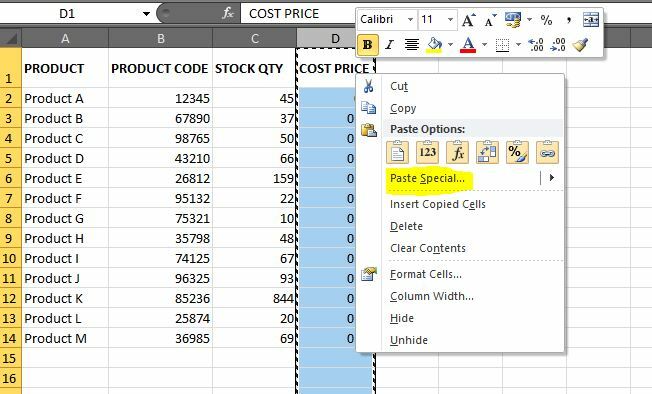 We also have another separate spreadsheet saved on the pc which contains the product code and cost price for all of the products. 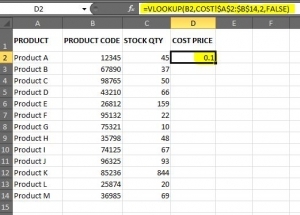 With the Vlookup formula we’re asking it to look up the product code in the cost spreadsheet and insert the relevant cost price into the stock spreadsheet. 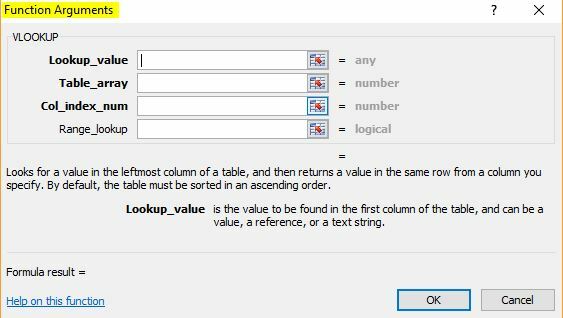 Lookup_value: This is the starting point of the formula. This is the cell that contains the data we want to look up. 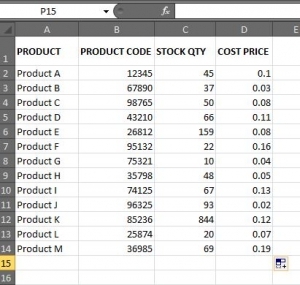 In this example that would be cell B2 (Product Code). Table_array: This is the range where data is retrieved from, so in this example it would be the sheet containing cost prices. Ranges can be in the existing worksheet or a different one. 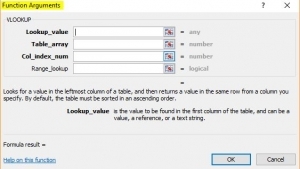 Col_index_num: This is the number of the column in the table array that has the information we need. The first column of values in the table is 1. 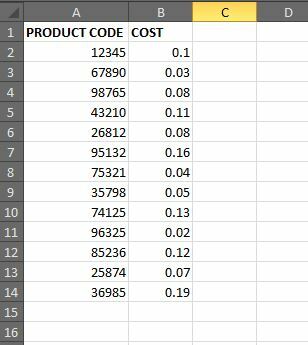 In our example it would the Column B containing the cost prices, so that would be column number 2. Range_lookup: This field defines how close the information has to match e.g. do we want the information to match exactly or just be as close to it as possible. The LEFT column must contain the data being referenced. 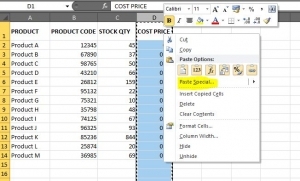 So in our Cost sheet the Product Code must be on the left. Values in the leftmost column of the lookup range must be unique, i.e. no duplicates. 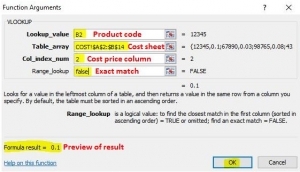 In our example the Product Code can only appear once in the table array. 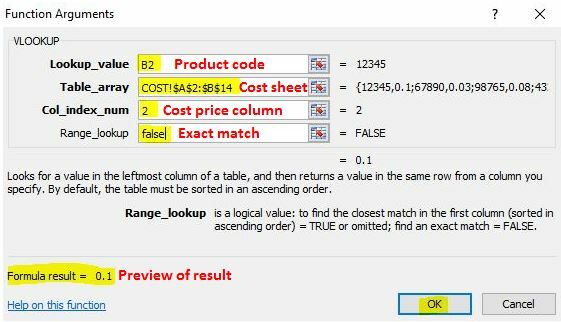 If the formula is to be copied anywhere else the table array referenced in the formula needs to be an absolute reference. In other words, the table array needs to stay fixed and not move down a row if you copy the formula down. 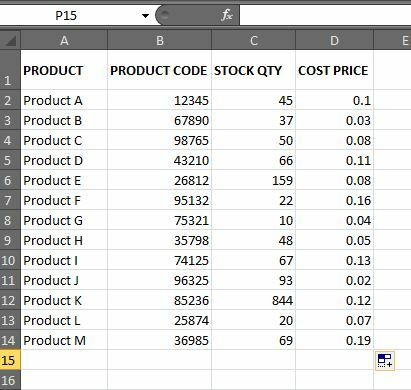 To make sure the table array is absolute, press F4 to insert a $ before the column & row figures. For example in the image above you’ll see under Table_array $A$2:$B$14; this means the array will stay within cells A2 to B14 no matter where we copy the formula to. We can always spot check values in the table array on the other sheet to double check it’s brought through the correct figures. 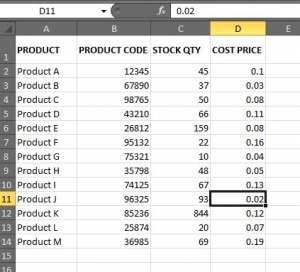 Remember that Column D still contains the Vlookup formula. If we want to remove the formula & only keep the values then we need to paste special as values. 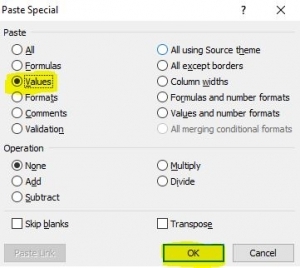 This will open the paste special dialog box where you can choose how you want to paste the cells. 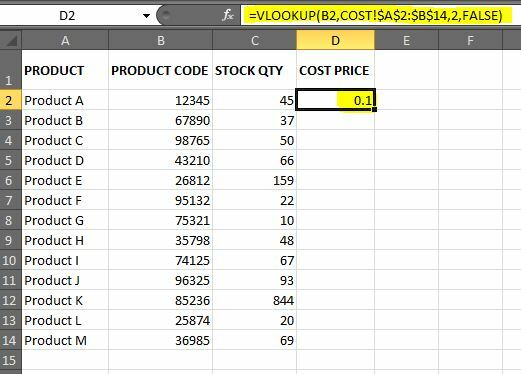 You want to get rid of the formulas and only keep the actual value of the cell, so click on Values and press OK.